Riverview students got ready for the Christmas break by having a school wide Christmas Sing-A-Long. Then Mrs. Porter and the student council led the school in Christmas songs. Santa Claus made a special visit to Riverview. All of the students did a great job and it really got everyone in the Christmas spirit. First Graders Celebrate 80 Days of School! Mrs. Jensen's first grade class celebrated the 80th day of school by dressing up as students in the 80's. First graders had a lot of fun dressing up and participating in activites for 80's day. Happy 80th day of school! The 6th grade orchestra performed for Riverview students. The orchestra performed Three Blind Mice, Are You Sleeping, Mary Had A Little Lamb, We Wish You A Merry Christmas, and Jolly Old St. Nicolas. Riverview students had a fun time singing along to Jingle Bells. Thank you 6th grade orchestra for all of your time and hard work. It was a wonderful concert! 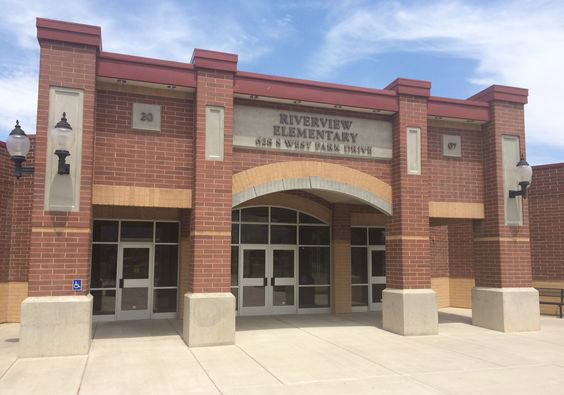 The Rotary Club and Triple T presented each Riverview third grader with a dictionary. The third graders were so excited to receive the dictionaries and use them in their classrooms. Thank you for the dictionaries! Riverview third graders read and discussed the story “Aero and Officer Mike.” Then students met Officer Cory Grover. Officer Grover brought his police dog and talked with the students about the training that he and his dog went through together. Officer Grover explained how his police dog is a loyal partner and they work together every day. Students had a great time making connections from reading "Aero and Officer Mike" and meeting Officer Grover and his police dog. Thank you for your service! Riverview is happy to announce November’s Stand Strong Honorees. Each of the students and faculty members did a kind act such as helping a student when they fell down, being awesome, helping a student understand their math assignment, being kind to friends, giving a book to a student who wanted the book, having good sportsmanship, playing with someone who needed a friend, following directions, apologizing, helping a teacher, helping someone clean up, and always being happy and kind. Great job for Standing Strong! Keep up the great work! Riverview is happy to announce Crew of the Month for November. Mrs. Bundy’s fifth grade class was the best class to walk in the halls for the month of November. Mrs. LeMmon’s third grade class was the best class during P.E. for the month. Mrs. Cook and Ms. Sivak’s first grade classes had the lowest amount of students who were late in the morning. They each had 9 students who were late to school for the entire month of November. Congratulations on Crew of the Month for November! Many Riverview students participated in an assembly where they were able to perform skits showing how to stand strong and deal with little deals. Students have learned that to stand strong means to walk away, ask the person to stop, or do something to distract the person from continuing the behavior. Thank you Mrs. Smith for teaching us how to Stand Strong!